Free fully functional 30-days trial! Subscribe to be the first to know about hot prices and gifts! How to move task settings from version 7 to version 8? How do I know if I need 32-bit or 64-bit version of Handy Backup? How can I download a specific edition of Handy Backup? Is there a difference between trial and paid versions? How do I get Handy Backup in non-English languages? Where can I find installation and startup instructions? Where can I download old versions of Handy Backup? If you have any other questions, please don’t hesitate to write us. Create new tasks in Handy Backup 8, re-writing all properties for each task manually. Handy Backup will automatically select the 32- or 64-bit version that matches your operating system a best way when installing itself on your computer. Both version share a common installation file. 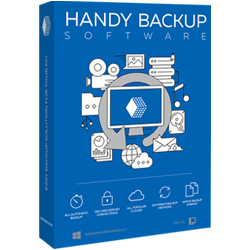 Just download the latest version of Handy Backup and start the installation process, and Handy Backup will install a 32-bit or a 64-bit version, depending of your OS. Handy Backup has a common installation file for all editions of the program (Standard, Professional, Small Server and Server Network). To select an edition, please download and install Handy Backup, then buy a registering key for a specific edition you are need to purchase. Trial version has no functional limitations, but is time limited to 30 days. For the first 30 days, you can evaluate all features free of charge. When the trial period expires, you will need to obtain a registration number and register the program. After registration, Handy Backup’s functionality will be defined by the registration number that you used. For example, if you purchased a Handy Backup Standard license, then you’ll be able to use features of the Standard edition only. You can compare different editions in Handy Backup comparison chart. Handy Backup is available in multiple languages, and if you want to use it in a different language, there is no need to specifically download a different version of the program. 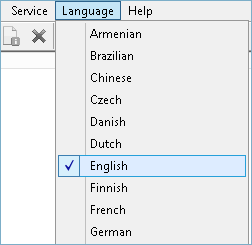 After you select a different language, the program automatically restarts. Open the program’s folder in All Programs, and then click Uninstall Handy Backup. Open Control Panel, and click Uninstall a program in the Programs section. Find Handy Backup in the list, select it, and then click Uninstall on the toolbar. When you uninstall the program, all settings, tasks and registration information are left on the computer. If you decide to install it again (e.g. if you are updating to a new version), you won’t need to create them again. As a general rule, you should always use the latest version of Handy Backup. However, there may be cases when you want to use some specific version of the program, or download some of its components. To download old versions, please refer to the Download Archive.